Today, I caught Glenn Beck on The Blaze and his excellent showcasing of Obama’s Common Core Standards that are now in 45 states, including my state of Idaho. Common Core is Marxism for children. It is state run propaganda and is meant to dumb down and control our little ones. It is evil and it has been a long time coming. Obama pushed it through slyly and quickly after coming into office, but I can tell you, this has been brewing since at least the 1990s. A little background… When my children were in school in the 1990s, my husband and I requested to see the school curriculum for their school in Las Vegas, Nevada. We were refused and basically told we were too dumb to understand what the teachers were instructing our son and daughter in. The last straw came when they wanted to put my daughter in the second grade on Ritalin instead of disciplining her. I was pulled in front of four teachers and accused of not raising my daughter correctly, as well as basically being an abusive and stupid parent. I promptly told these teachers that they could pound sand and pulled our children (our son was in third grade at the time) out of school that very same day. I left the Fortune 500 and home schooled both of them till high school and in retrospect, should have kept them out even then. My children could not do the simplest of math or read when we pulled them out. I tested them and started them all over again with the ABEKA home schooling system, which at the time, cost a great deal of money. The children were tested by the state within a week of being pulled out and because they could not read or do math, the state threatened to remove our children, even though it was their damn lack of teaching that had produced this. Well, we knuckled down and by the end of the following year, both kids were excellent readers and were caught up in math. I never heard from the state again. My son went on to be a gifted software developer and although my daughter is still trying to find her way in the world, she is a talented artist and a survivor. Now on to the present matter at hand. I will tell you that George Soros and the Tides Foundation along with other major Progressive organizations and the Obama Administration are behind all of this monstrosity. Gee, I’m sooo surprised. 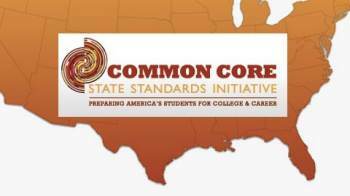 Educational policies are supposed to lie with the states, so the government coercing the states to carry the Common Core Standards violates the Constitution. The tracking database violates privacy at every turn as well. I strongly recommend you click on the links below and read what Michelle has written and fight to drive out the Common Core Standards from your state. While Obama took us from one emergency to the next, he was slipping in the back door to destroy our children who are the building blocks of the country. Get your children out of the public schools now and fight this at the state level. It is almost too late. I pulled my son out of school two years ago (early 7th grade); fortunately, he COULD read (no thanks to the schools), but any love of learning he possessed had been crushed out of him sometime during the previous seven years spent on endless basic “math facts” and “self pages”. Why aren’t people pulling their children out of these indoctrination camps by the droves? Is it because they don’t know about this: http://conservativeteachersofamerica.com/2013/03/13/common-core-is-not-just-about-standards-its-also-about-data-mining/? Or do they just not care? Be aware, too, that Common Core is infiltrating our colleges: https://chronicle.com/article/A-Bold-Move-Toward-MOOCs-Sends/137903/ and also through something called “Linked Learning” here in California. Great website; I’m very glad I found it. Sadly my liberal son is pursuing some training in this and pushing teachers he works with to do it as well – a real heartbreak for me. I’m sorry Sara. One can only hope he will somehow see the light. I’m cross-posting this. I hope it wakes some people up. Insofar as my son, I don’t know what happened to him. He is the opposite of who he was when he was at home. His wife is liberal and that could be the reason for the change. It’s like someone brain washed him. Congrats on this week’s win Terresa. Keep up the good fight. Texas has some outstanding folks fighting C-Scope. Pingback: The Council Has Spoken!! This Weekâ€™s Watcherâ€™s Council Results » Virginia Right! I just spoke with my son and was thrilled to hear that he actually hates the Common Core but has no choice. He said no teacher he knows likes it, left or right. He said Murdoch as well as people like Bloomberg and Gates are involved. He said the teachers are hoping it collapses in a year or two when parents realize how bad it is and start calling their legislators. It’s similar to what Bloomberg did with the NY schools which proved a disaster. Interesting since he’s a liberal.